Rhode Island Governor Gina Raimondo rehearses the annual state of the state address in the House of Representatives at the Rhode Island State House, where it was delivered Jan. 15. PROVIDENCE — A landslide? Hardly. But in winning reelection with 53 percent of the vote in November, Gina Raimondo earned what no Rhode Island governor has achieved since 2006: a majority. In a multicandidate race, that’s a mandate, Raimondo says. And now a politician who rose to prominence by pushing pension reforms that enraged public employees is using her mandate to pursue a list of progressive policy goals: expanding a tuition-free college program, universal pre-K, raising the minimum wage, new gun safety laws, pot legalization. She is calling for more money for public schools, after a round of distressingly low student test scores. On a national level, Raimondo, 47, is the new chair of the Democratic Governors Association, a position that will require more out-of-state travel and will probably raise her profile outside of Rhode Island. Yet rarely is anything easy in Rhode Island politics, where a cynical electorate always seems to be anticipating the next political scandal or government blunder. Elected in 2014 with 41 percent of the vote, Raimondo saw generally weak approval numbers throughout 2018. Meanwhile, a short drive up the highway, Governor Charlie Baker of Massachusetts spent his first term basking in approval ratings around 70 percent, often the highest among governors in the nation. Raimondo’s signature issue as state treasurer — public employee pension reforms that suspended cost-of-living increases, among other changes — “divided her Democratic base, and it has taken a long time to recover from that,” said Darrell M. West, director of governance studies at the Brookings Institution, a Washington think tank, and a specialist in Rhode Island politics. Yet Raimondo made significant progress in 2018 and “won by a larger-than-expected margin,” he said. In a recent Globe interview, Raimondo said low approval ratings seem to come with the territory for Rhode Island governors. “As a result, I try not to focus on it and focus on the results of the job,” she said. During her first term, she concentrated on rebuilding infrastructure and expanding job training. Rhode Island’s unemployment rate fell from 6.8 percent the month she was elected to 3.8 percent four years later, according to state figures. “When I first got here right after I was elected, things were not looking good,” Raimondo said. “The whole time I ran for office in 2014, for most of the months of that year our unemployment was number one in America. Every governor feels like they inherited a tough hand but I really did. I felt like, all right Gina, focus on the economy, get people back to work. You’ve got a crisis. You’ve got to make something happen. “We’ve done that,” she said. 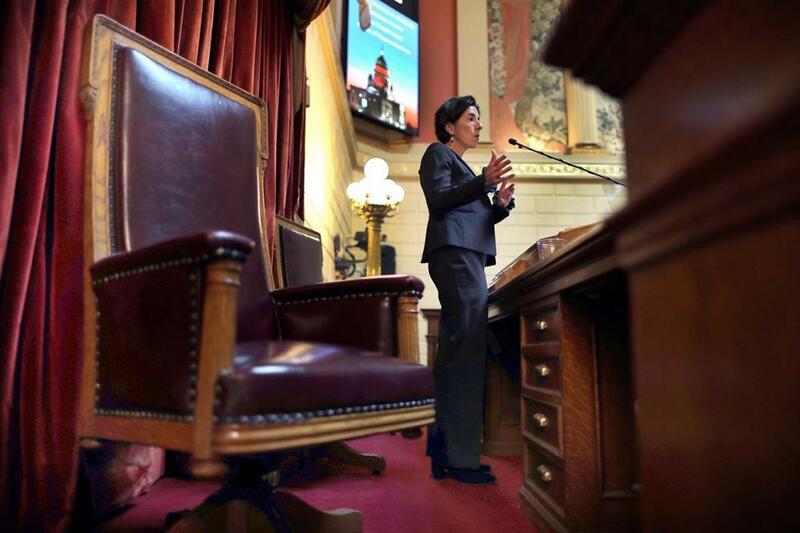 Success over the next four years will be measured by how the state maintains and builds on those gains, Raimondo said, and whether Rhode Island can make its economy better able to weather broader economic downturns. Brown University political scientist Wendy Schiller, however, said “dark clouds” could threaten Rhode Island’s recovery if the national economy spirals down. The success of Raimondo’s second term also will hinge on improving a public education system that “has been recently bruised by low test scores,” Schiller said. Rhode Island began using the Massachusetts Comprehensive Assessment System to test students, and found that on the whole, Rhode Island kids scored 17 points lower than their Massachusetts counterparts in English and 20 points lower in math. As the Providence Journal starkly put it, if the state of Rhode Island were a single Massachusetts school district, it would rank in the bottom 10 percent of all systems. The lackluster results underscore the need for improvement, Raimondo said. Rhode Island pollster and political analyst Joe Fleming said student test scores “are not going to improve overnight,” but that Raimondo needs to see some gains to have her second term be judged a success. As the new chairwoman of the Democratic Governors Association, Raimondo will be responsible for getting more Democratic governors elected, a task she seems eager to tackle. She also has plans for a “good ideas incubator” within the association to showcase innovative policies of Democratic governors. “The DGA is a great platform for building a national brand,” said West. “It can lead to Cabinet positions or other posts.” Her selection indicates that Raimondo is “well respected nationally and seen as a rising star,” he said. Raimondo is term-limited and cannot run again for governor. She has been discussed as a potential presidential candidate, but she says she does not think about her next job.